Thomas Hopper: Hello! My name is Thomas Hopper and I’m the developer behind ACORN Tactics. I’ve been trying to make it as an indie developer for a few years now. I released a bunch of games on the Wii U and in a few other places. The team on ACORN Tactics is very small. I’m responsible for code, art and gameplay and for the first time I’ve teamed up with a great composer, Peter Silk, for the game’s amazing dynamic chip-tune/orchestral soundtrack. The music changes as you play! It’s really very good. Miketendo64: For our readers who have not heard of ACORN Tactics before, what is it, and why should Switch owners be excited about it? Thomas Hopper: ACORN Tactics is a turn based tactical battle game in which alien blobs from space invade the earth 100 years after a disaster floods most of the planet. The Armored Combat Operations Response Network (ACORN) must develop build and deploy giant walking tanks in order to combat this new invading force. The player must build a custom team of giant robots, level them up and improve them with research in order to be a match for this new threat. I tried to make the game as colorful, funny and unusual as possible while still delivering an accessible tactical combat game that anyone could get into. Miketendo64: Given the fact that the Switch has already seen a turn-based tactics game in the form of Mario + Rabbids Kingdom Battle, how does ACORN Tactics compare? Thomas Hopper: I’ve been too busy with my work on ACORN to get a chance to play M+R:KB as of yet but I love tactical games and I will get around to it as soon as I can. My two big inspirations for the game are XCOM and Advance Wars. I didn’t want to replicate them exactly but ACORN does share some elements with both. It also has some ideas I’ve stolen from other genres altogether. 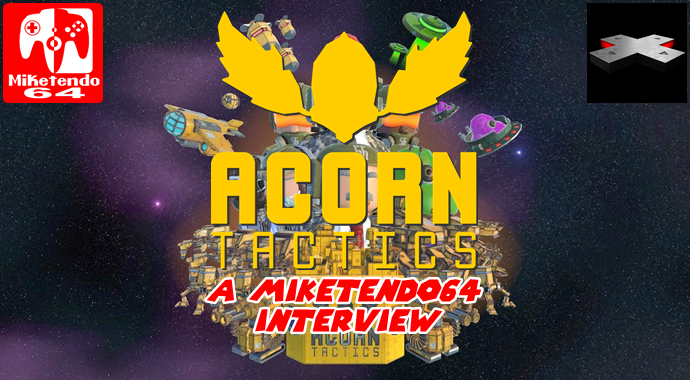 Miketendo64: How faired development and where does the art style for ACORN Tactics come from? Thomas Hopper: ACORN went through quite a few changes over its years of development. In early development the ocean bases were more like little towns. They almost looked like GTA 1, blocky and with lots of sharp corners. While I was working on the designs of the robots I decided to go back and rework the graphics entirely into colorful ocean bases. Almost like a modular oil rig. These new designs were inspired by the likes of BIG SHELL and the MOTHER BASE from the metal gear solid games. Thomas Hopper: ACORN uses HD Rumble and it feels great. Every weapon, explosions and big stompy robot foot vibrates the switch controllers in ways previously not possible. There’s also a really cute feature available if you have colored Joy-Con or any other colored controller. When you’re painting your mechs you can push a single button and have the mech’s paint job and running lights changed to the color of your controllers. I have some of those Splatoon Joy-Con Controllers in pink and green and they make a very lovely mech paint job. Miketendo64: With more and more developers citing praises for the Nintendo Switch, how do you feel about the Nintendo Switch and how are you finding the process of porting a game to the Switch? Thomas Hopper: Working with Nintendo and their hardware/tools is always a good experience but getting ACORN up and running on Sswitch was a delight. I’ve had no serious issues and I’m looking forward to getting more stuff running on Switch hardware as soon as possible. Miketendo64: With ACORN Tactics being your most expansive game yet with a campaign and endless battles for the experienced gamer, are there any plans for future DLC or added content? Thomas Hopper: I have no planned DLC for the game. The endless battle mode really makes it possible to play the game as much as you’d like. This mode isn’t just taking existing levels and swapping around enemy placements – it generates entirely new base layouts. The whole game was randomly generated like this for a while. I found that if I wanted to make any kind of coherent story with a progression of enemies and character development, then I would have to hand craft my levels for the story mode. In early development it’s great to have an endless supply of random levels. It makes testing much more enjoyable. At the end of development I worked the generator back into the game as the endless mission mode. You get daily random missions or you can enter some seed word and get a mission from that. You can share your seed words with your friends and they’ll get the same mission. Miketendo64: Other than what has been said already, is there anything else you would like our readers to know about ACORN Tactics at this time? Thomas Hopper: There’s a bit in it where the alien blobs put on trousers and try to pass themselves off as humans. It doesn’t work very well. Miketendo64: Are there any plans to bring any of your previous/upcoming games to switch any time soon? If so how long do we have to wait to be able to play and enjoy them? Thomas Hopper: Regarding ports of my older stuff, I’m never quite sure if people want this kind of thing. I could probably fairly easily bring something like OCTOCOPTER: SUPER SUB SQUID ESCAPE or RADIANTFLUX: HYPERFRACTAL over to switch and they would run better and look great. But do people want that? I’ve no idea. Going forwards, any new games I work on will be developed for Switch first, so expect some more things from me in the future. That might not be for a while yet. ACORN took almost three years to complete. This is what happens when you work mostly alone! Thomas Hopper: Thanks for checking out ACORN Tactics – please buy it on the 30th November in Europe and 7th December in the Americas. If everyone buys it I can finally afford to finish building my UFO. I will not use it to invade Earth. Promise. As Thomas, best of luck with the release. We hope it goes well for you and we will endeavour to do our best to get our review out soon and share just exactly what we think of it!